Beautiful furniture, large, clean, nice view out the balcony. Great view, modern apartment facilities, spacious, and located close to the train station. Very good location, wonderful view, place was absolutely clean! Value for your money! Grand Canal View, and the contemporary apartment with two bedrooms with two bathrooms(only one ensuite). Right in the heart of the great vibrant Venice. The property was easy to get to from the parking, about a ten minute walk. The apartment had nice balconies and a great view of the grand canal. The kitchen was nicely equipped, and there was a great grocery store 5 minutes away. The apartment was accessed by code, so there was no worry of keeping up with keys, and check-out was super easy. Location is superb. Very accessible from Sta. Lucia Station, no need to cross any bridges. the apartment was beautiful and very clean and very large. The location was the best in Venice. The apartments where huge and spacious and accommodated all 11 of us easily . The quality of the furniture and fittings was excellent. Highly recommend to anyone who wants to be in the centre of everything with stunning views over the canal. 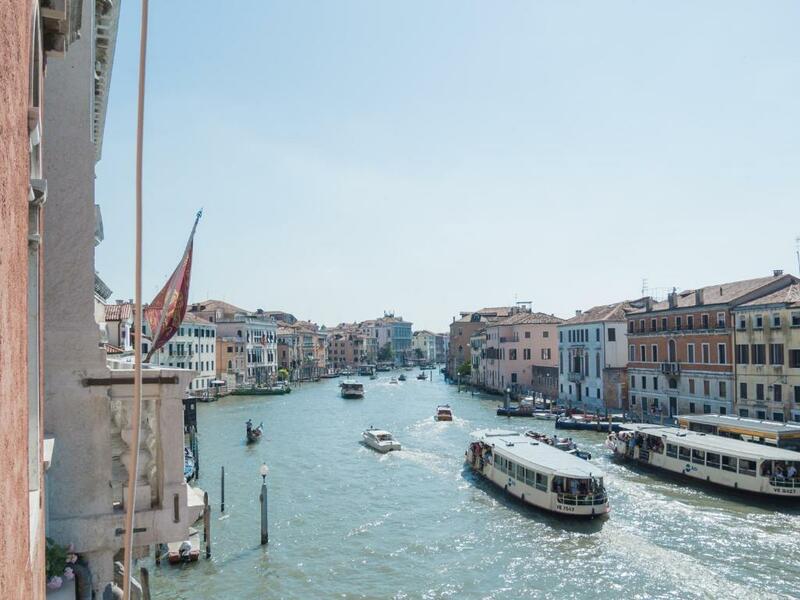 Lock in a great price for Venice View On Grand Canal – rated 8.8 by recent guests! One of our top picks in Venice.Located in Venice, Venice View On Grand Canal has accommodations with a kitchen. Free WiFi is provided. Each unit is fully fitted with a washing machine, a satellite flat-screen TV, a sofa and closet. There's a fully equipped private bathroom with bidet and free toiletries. Popular points of interest near Venice View On Grand Canal include St. Mark's Basilica, Rialto Bridge and Piazza San Marco. The nearest airport is Marco Polo Airport, 13 miles from the property. 뀐 Located in the top-rated area in Venice, this property has an excellent location score of 9.5! When would you like to stay at Venice View On Grand Canal? Check-in takes places at the reception desk located in Piazzale Roma at Santa Croce 515 where an experienced and friendly staff will be ready to welcoming you and helping with the registration procedures as well as to offer you all the services available, excursions and visits to numerous sites that Venice offers. The reception is open to the public from 8:30AM to 11:00PM (with baggage deposit). After 11:00PM Check-In is only made online, and only after sending all the guests ID and paying the balance of the tourist tax. After booking you will be contacted by the staff to find out more about your arrival in Venice and to help you organizing your Check-In together. Given the strong flux from and to the airport, we advise all our customers to request and book the shuttle service that we can provide. In fact this service, agreed with a major transfer company and at an appropriate price, will make you avoid queues to public transport. Venice View On the Grand Canal welcomes you in the Cannaregio district, one of the liveliest areas of Venice with its many characteristic venues to enjoy an authentic Venetian atmosphere. The proximity to the train station and Piazzale Roma makes the residence a very convenient solution for your vacation. Within a few minutes walking, you can reach these two strategic points, while in terms of churches, monuments and interesting places from the historical, artistic and cultural point of view you will be spoiled for choice. It is located in Rio Terrà San Leonardo, in the heart of the Strada Nuova, a few steps from the ancient Jewish Ghetto and close to the Rialto Bridge and St. Mark's Square. Two minutes away is the Casino of Venice, housed in the beautiful Vendramin Calergi Palace, overlooking the Grand Canal. House Rules Venice View On Grand Canal takes special requests – add in the next step! Venice View On Grand Canal accepts these cards and reserves the right to temporarily hold an amount prior to arrival. Please inform Venice View On Grand Canal of your expected arrival time in advance. You can use the Special Requests box when booking, or contact the property directly using the contact details in your confirmation. The balcony facing the canal was on the master bathroom, which was a little strange. There were no lamps in the apartment, so it was either all bright lights on or all off. The bedding was very basic, and the pillows were really flat and hard. It Was hard to find the office. The kitchen should have had the basic like salt and pepper. First day there a staff member walked in on us. The location the comfort and the size. The wifi went down on the second day and werent able to fix it. Location very good, nice View to Grand Canal. We booked a big room that was good for 7persons. We were only 5 and the property knows that when we booked. We also know ahead that we were going to pay 30euros total for city tax. But when we checked in, we paid 40euros. I asked why 40euros when they said it was 30euros during booking. The property manager said that since our room can occupy 7persons, we have to pay city tax for 7persons which is 40euros instead of 30euros. It would be better if they just put 40euros city tax for that particular big property regardless of number of occupants to avoid misunderstanding. the location of the apartment was great but the reception was in a different place! so we had to walk with several luggages to the reception place only to get the keys and then get a taxi back to the apartment that is very close to the train station. this should have been mentioned more clearly in the hotel description. Amazing location apartment was fantastic!! The place was incredible, couldn't fault anything. From the front bedrooms you can hear the boat traffic late at night, but nothing to worry about. The balcony in the large apartment is on the grand canal. Amazing. 1 Toilet door cannot lock, 2 bedrooms inside the plug is cannot use. It’s a bit on the pricey side but it’s comfortable and clean. The location is great, just 5min walk from Santa Lucia station. The apartment have windows facing the Grand Canal which is scenic. The apartment itself is also great, clean, lots of facilities, 5-star bathrooms, comfortable with a 50” smart tv. We had a really wonderful stay and wished we have stayed longer. Finding the agent took 45 minutes because directions were poor; the woman was rude and generally unhelpful; there was no washing machine as was promised, and this was an important omission and wasn't mentioned by them. Apartment is gorgeous and well-appointed and large and has a view right on the Grand Canal and is close to the (Santa Lucia) train station. Bathroom and kitchen both terrific.